We have captured a handful of the Uthuk forces, and fate has favored us: these seem less tainted by monstrosity than the others. My captains hope our captives can provide information to aid in tomorrow’s assault. The captives have been secretly divided among our strongholds, and not even I know their exact whereabouts. Many of my men think this secrecy unnecessary, but rumors have spread that a Mountain Giant has joined the enemy. If this is true, I fear that no precaution could withstand the carnage this beast will create. Mountain Giants are nearly legendary in Terrinoth. These fearsome creatures rarely stray from the cold fastnesses of their mountain lairs, but when they do venture forth, they can cause unprecedented destruction. When brought to a battlefield, a Mountain Giant could cause horrific damage to his enemies before he is finally overwhelmed by sheer numbers. With the Mountain Giant Reinforcement Pack for BattleLore Second Edition, you can increase the power of your armies with your own massive Mountain Giant. 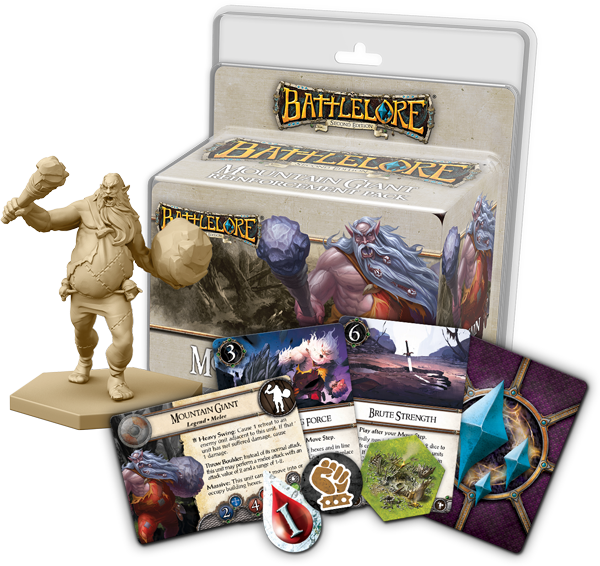 Between the figure and new cards, this Reinforcement Pack offers new strategies for developing your BattleLore armies. Today, we’ll explore the new tactical options offered by this expansion. The Mountain Giant is a powerful foe and it owes its allegiance to no single faction. The Mountain Giant in BattleLore Second Edition is a neutral unit that can fight alongside the Daqan Lords or the Uthuk Y’llan. Before you and your opponent muster your armies at the beginning of the game, you both have the option to draft any available neutral units and bring terrifying creatures like the Mountain Giant, the Razorwings, or the Great Dragon onto the battlefield. A Mountain Giant is ponderous and slow-moving, but dangerous in combat. Its crushing blows can wipe out entire units with a single attack. 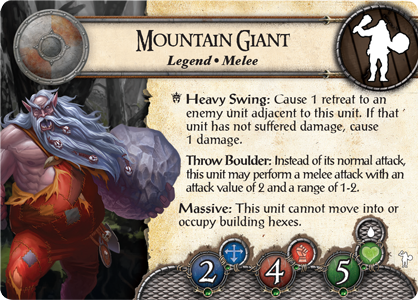 Mountain Giants commonly use a large club as their weapon of choice, and their flailing blows may even affect units that they have not directly attacked. With the Heavy Swing ability, you can commit a heroic result to force any enemy unit adjacent to the Mountain Giant to retreat. Most importantly, this unit doesn’t even need to be the unit that you’re currently attacking and if the retreating unit has not yet suffered damage, the Heavy Swing deals one damage to it! By sending your Mountain Giant charging into the midst of your opponent’s forces, you can quickly scatter the various units in your opponent’s army. Because the Mountain Giant is so powerful at close range, your opponent may attempt to avoid closing to melee combat with him. If your Mountain Giant can’t quite reach your enemies with his club, he can always pelt your enemies with thrown boulders. Instead of using his normal attack, the Mountain Giant can make an attack with two combat dice and a range of up to two hexes. Hurling boulders in this way allows the Mountain Giant to command an even wider area of the battlefield. If you include the Mountain Giant in your army, you also gain access to three lore cards that you can use to customize your lore deck. For example, you may level an opponent’s strongpoint with the Crushing Force lore card. 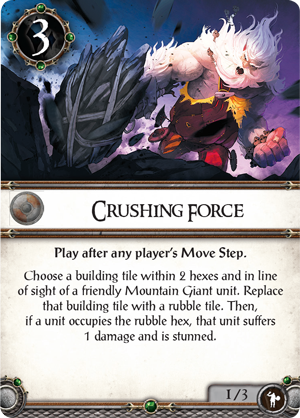 When you play this card, you can choose any building hex within two hexes of your Mountain Giant and replace the building with a rubble hex! Then, if a unit remains in the rubble of the fallen building, it suffers a damage and becomes stunned. Because buildings are the most powerful defensive structure in BattleLore, breaking a building into rubble can tip the scales of battle in your favor. You may also need to quickly slip through the forests to make a sudden attack or support your other units. 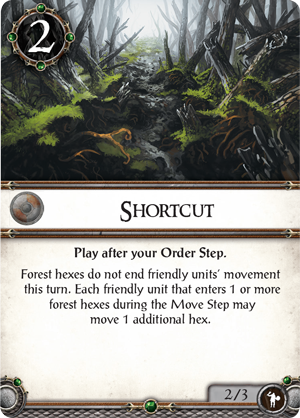 The Shortcut lore card allows you to move through forests without ending movement during your turn and if you move through a forest hex, you can move an additional hex. When the Shortcut lore card is a trick in your repertoire, your opponent can never be certain your units won’t suddenly appear out of the trees. The final lore card in the Mountain Giant Reinforcement Pack benefits all of the deadly creatures and monsters in your army. 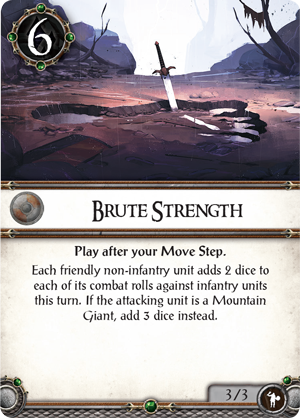 Brute Strength adds two dice to the combat rolls of each friendly non-infantry unit and if the attacking unit is a Mountain Giant, you can add three dice instead. This massive increase in attack power may allow you to completely exterminate the toughest enemy unit or send them fleeing for the edge of the battlefield. With the Mountain Giant’s unleashed might and these three powerful lore cards supporting your army, you can bring a new level of power to your armies in your games of BattleLore! 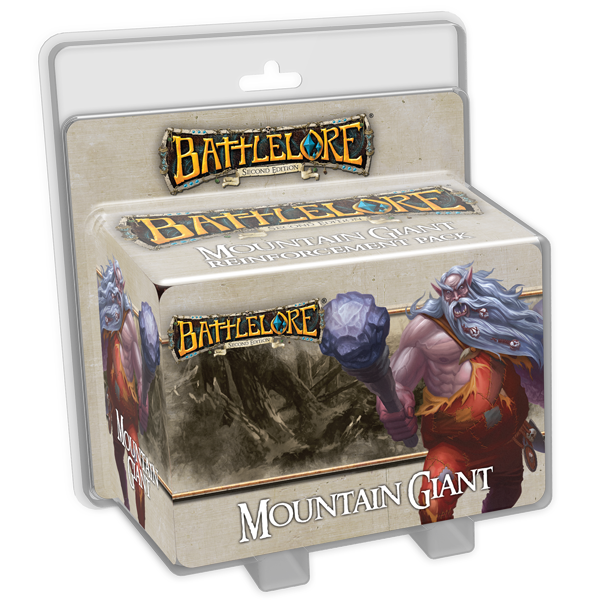 The Mountain Giant is a fearsome fighter, but he’s not the only creature arriving in BattleLore Reinforcement Packs. Check back for previews of the Great Dragon Reinforcement Pack and the two Undead army packs, Heralds of Dreadfall and Terrors in the Mists! In addition, you can find the first two army packs – Hernfar Guardians and Warband of Scorn – on sale at your local retailer today. Finally, if you're craving even more BattleLore in your life, BattleLore: Command will go on sale on Steam for $3.99, starting tomorrow, June 11th. Explore the world of BattleLore, and remember to pre-order your Reinforcement Packs at your local retailer today.